Nominations will be accepted from September 30th to November 1st. To nominate, post a comment here at the website, or email us at email@thebrownbookshelf.com. You can nominate as many books as you like. Please check out past 28 Days Later campaigns to see who’s already had the spotlight. NOTE: Please note that due to the limited resources of the team, we can only take nominations for traditionally published books. 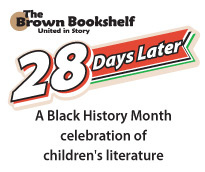 We may highlight a small number of self-published authors for the 28 Days Later campaign, but these authors will be nominated and picked by the Brown Bookshelf team. If you have any questions on this matter, please email us at teambrownbookshelf@gmail.com.